Paul Lindhard, founder of Art City, a unique artists’ enclave located in west Ventura. 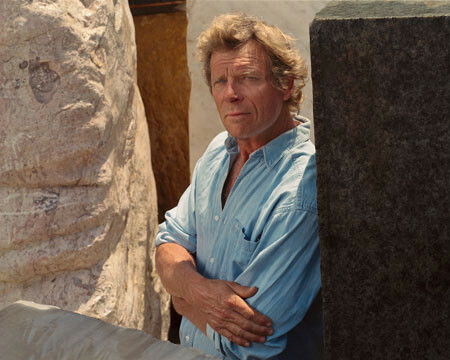 Primarily a stone sculptor, Lindhard founded Art City so that it would serve as a constant artistic stimulus to enhance his own work and the work of others. As the studios grew in both size and respect, Lindhard soon realized the value of a community studio and the numerous advantages of working in close proximity to other creative minds. Established in 1985, the Art City studios and gallery continue to attract well-respected artists both locally and abroad. As an undergraduate, Lindhard studied fine art in California and Mexico, culminating in a Bachelor of Fine Arts degree from UC Santa Barbara in 1970. In 1976, he enrolled in the MFA program at Pennsylvania State University where he served as artist-in-residence and taught bronze casting. From 1978-1988, Lindhard taught sculpture at Santa Barbara City College. Lindhard travels throughout the world selecting and frequently hand quarrying the stone. According to him, stones are basically found objects which give voice to nature, and in his work, he seeks to balance what he sees on the outside with what he finds on the inside. Carving for Lindhard is a visceral experience, a journey into unexplored and unending territory. Paul Lindhard’s documentation took place in 1998. The FOTM Archive contains extensive information about this artist.